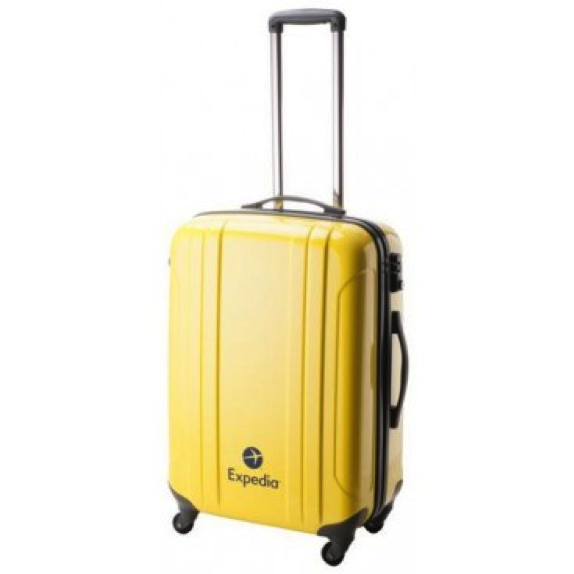 Win an Expedia Yellow Suitcase and support Passports With Purpose 2013!! I’m auctioning off a genuine Expedia Yellow Suitcase!!! How to get in on the bidding? Passports with Purpose is the annual Expedia-sponsored online auction to benefit a charity abroad. This year it’s buildOn.org, which builds schools for girls in Mali, Africa. Travel bloggers like myself procure items to auction off, and the whole shebang happens on PassportsWithPurpose.org. Please help support this awesome charity… AND GET AN EXPEDIA SUITCASE! When: November 25th- December 9th. There’s a lot of chat on the Expedia Travel Discussion list about going to Iceland (IcelandAir flies nonstop from Seattle to Reykjavik daily). Here’s a good article to answer some basic questions on visiting on a budget. …and one of the reasons to go Iceland is to see the Northern Lights. But there are other good places to see them, too! …and if you’re traveling to icy Nordic outposts, you should go all in and stay at an ice hotel. Lonely Planet released its Best Places to Go In 2014 list. Seychelles and Latvia are on my to-do list! I do luvs me some travel-funny. These airport names are awesome. Note they don’t mention one of my favorites, Italy’s Malpensa Airport. Which means “bad thoughts” in Italian. And trust me, that hellish airport is aptly named. I love random travel factoids, and this chart is fascinating. You can snicker at this, or think it’s weird, until you find yourself forced to sleep in an airport. I spent a lovely evening in Vancouver International Airport once when my flight dropped me there at midnight, and my next flight wasn’t until 4am. It wasn’t so bad, with this site’s help. Of course they do. Because really, why AREN’T you spending more of your hard-earned money to take a cotton-based item assembled in China on its own holiday? Ever bought a Groupon Getaway? Ever wondered if you were REALLY getting a good deal? Ahh, public art. Love it. This is awesome. Can you imagine living in a place that has never, ever seen sunlight in winter?? And today’s “That’s the strangest travel story I’ve read this week” installment…. The article reports at length on ostensible structural advantages, detailed in a report from research firm Evercore, that allow Booking.com to prosper where others struggle. The Evercore analysis smacks of Monday morning quarterbacking to me as it finds reason after reason that others cannot surpass Booking’s success. For example, it is undeniable that Booking.com has executed Search Engine Marketing (SEM) better than anyone else, but I am highly skeptical that Booking’s use of the Perl scripting language confers a significant SEM advantage. I believe that others can match or surpass Booking’s success if they have the discipline to focus on results, eliminate legacy weaknesses and execute well. Boyd will remain as chairman of the board, but Booking.com president Darren Huston, a Microsoft alum, will take over as Priceline CEO and president.The transition has apparently been planned for some time. It is no surprise that Huston is taking over. However, the timing is surprising to outside observers, given that Boyd has just succeeded in taking Priceline from an also-ran to the top of the online travel industry. You can’t help but speculate that the old euphemism about wanting to spend more time with family and personal pursuits may actually be true in this case. Our neighbors down the street from Expedia HQ are improving their financial results. Lodging revenue rose 34 percent and packaged tour revenue rose 43 percent. Ctrip is experiencing strong growth in mobile bookings. HomeAway has made over 20 acquisitions since its founding in 2004. Orbitz’s Q3 room night growth was 22% and half of its trailing 12 month revenue came from hotels and travel packages. Airbnb is a member of the Internet Association along with Expedia, TripAdvisor, Amazon, eBay, LinkedIn, and Google among others. Google Tour Builder allows users to tag locations on a Google Earth map, add descriptions, pictures and video and then share the resulting media-rich itinerary with others if desired. This short but informative article gives some good background about needed product features in the online events marketplace and includes an interview with Eventseeker product manager Daniel Lysaught. 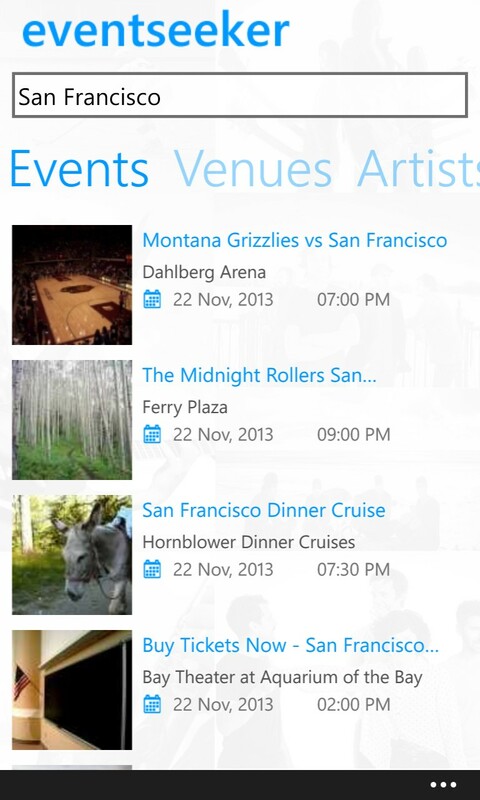 Eventseeker is available at Eventseeker.com and via iOS7 and Windows Phone 8 Apps. An Android app is forthcoming. I tried out Eventseeker.com and the Eventseeker Windows Phone App and found them both attractive and easy to use, albeit with some quirks such as photos that are unrelated with the events they are displayed with. Eventseeker and its competitors often suffer from a lack of personalized recommendations. Eventseeker makes it easy to find destination events and attractions, but even for medium size cities, Eventseeker displays so many choices that it can take some time for a user to choose. Eventseeker has made a good start at solving the destination events challenge, but it would benefit from more ways to filter and sort events. Eventseeker parent company wcities.com offers a real time API for venues, events and movies content. It would be very compelling for travel suppliers, planners and agents to integrate wcities content with sites and apps that consumers are already using to book lodging and transportation. 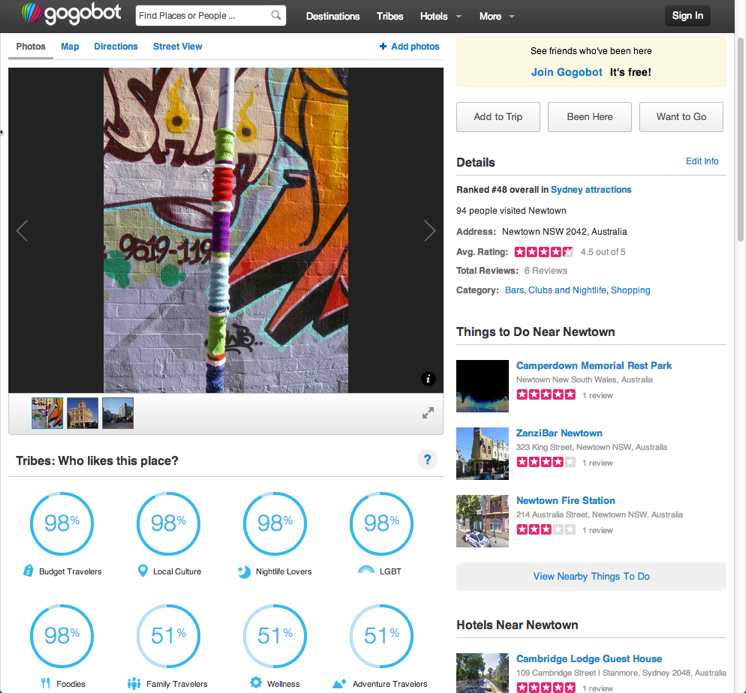 Gogobot, a social travel planning service, has rolled out a new user experience. Users choose named segments (“Tribes” in Gogobot parlance) that match their personal affinities and Gogobot personalizes search results correspondingly. For example, when searching for hotels in a specific destination, you can sort by Tribes such as Art & Design Lovers, Family Travelers, Foodies, Luxury Travelers, Trendsters, etc. It’s an interesting idea; I would be curious to know if it results in increased engagement and conversion. I spent a few minutes with Gogobot and can confirm that choosing a Tribe/segment significantly affects search results. The segmented results were in line with my expectations. It placed the Sydney Australia suburb of Newtown high in the ranking for foodies. I spent many pleasant lunch hours there exploring its wide variety of interesting restaurants. Overall, I found Gogobot’s “Tribes” an effective contextual filtering mechanism that travel planners may find helpful in creating personalized itineraries. This free tool has the advantage of simplicity but it doesn’t actually offer suggestions or do route or itinerary planning. It’s more like a Pinterest board with links to more information and travel directions. Ranked highest to lowest: Free breakfast, Free WiFi, Free Parking, Room Upgrades and Fitness Center. “Ziva” and “Zilara?” I like Hyatt well enough, but they should send their branders back to the brainstorming room. Aimed at hoteliers, the article notes that Booking.com, Expedia.com and Hotels.com do a good job of communicating urgency (“This hotel is likely to sell out soon!”) as users browse through their inventory. In contrast, most hotel sites the writer viewed did not include urgency messages. CEO Ben Baldanza says there are 500 routes with opportunity for the ultra low cost model. It’s interesting that a private company felt it necessary to pay for automated customs kiosks when it and its passengers already pay taxes that are supposed to fund Customs and Border Control. Minnesotans, take note: Delta is subsidizing the U.S. federal government but getting your state to pay for renovating a Delta call center. Airlines must track remedial training for pilots who fail to meet certain milestones. Pilot training must be enhanced for stall recognition and recovery, dealing with crosswinds and runway procedures. The US Department of Transportation is requiring airline websites and automated airport kiosks to be accessible to passengers with disabilities. Airlines have two years to make core travel information accessible and three years to make their entire site accessible. Etihad has come out of nowhere since its launch 10 years ago. Its goal now is to become the world’s best airline, and by many accounts, it is well on its way. Not mentioned in the article is that the recent success of some middle east-based airlines has been bolstered by supportive finance, tax and regulatory environment in their home countries. The combination of structural advantages and excellent management has made world-class carriers out of the top airlines from the region. This is an engaging first-person account of trying out the new low-cost but classy intercity bus services that have sprung up in the U.S. over the past few years. Written in classic road-trip narrative style. This article reports that cruises trail other travel products in going online because the large number of cruise product and service options results in a high level of complexity. Although many startups have tried and failed to prosper in the space, I question whether the inherent complexity is insurmountable. Recent advances in software and systems architectures have made solutions to many previously intractable problems possible. A case study in how not to do an acquisition. If heads didn’t roll at the Beeb, they should have. Kevin Chenais came to the Mayo Clinic in Minnesota 18 months ago for treatment of a hormone imbalance. Kevin, who weighs 226 kg (490 lbs), was denied return passage to London on British Airways on safety grounds. His parents tried to book him passage on Cunard Cruise Lines but they also turned him down. Virgin Airways eventually flew him to London but that was not the end of his troubles. Eurostar refused to transport him home to France through the Channel Tunnel, citing a safety policy that requires that passengers be able to be evacuated in an emergency.Happily, ferry company P&O came to the rescue and got him back to France. Until now, Conde Nast Traveler had a Consumer Reports-like policy that writers shouldn’t accept free or discounted products and services and other special considerations from travel suppliers. Under new editor Pilar Guzman, the policy has changed to allow such special considerations. A commenter to the story noted that given the rates CNTraveler pays to freelancers, the old policy meant that writers and photographers would lose money on many stories unless they were receiving other payments. Prolific tweeting professor Bill Fischer explains that he uses the service for his own selfish benefit: “…if you are in ‘the ideas business’, then Twitter is too powerful to pass-up. He says it’s efficient, effective, connective, discipline-instilling and serves as a virtual memory. And other factoids in the article are of little value: “A good way of searching Instagram is by hashtag #?” A large number of Instagram users will figure that out the first time they use it. Many experienced travelers are familiar with the U.S. Department of State’s Travel Warnings. Fewer travelers are aware that foreign countries (okay: mostly France) warn their citizens about risky areas and activities in certain U.S. cities including Boston, New York, Washington D.C., Baltimore, Richmond, Pittsburgh, Cleveland, Detroit, Chicago, Houston, St. Louis, Atlanta, New Orleans, Miami, Los Angeles and El Paso. The headline isn’t really correct, there is a design, it just maximizes reuse of existing resources in an attempt to not get in between the user and the desired functionality. Despite all the bad publicity that accompanied Apple Maps’ debut and first anniversary, Google has lost 23 million iPhone users since Apple Maps’ debut. The TSA is partnering with Marriott’s Springhill Suites to test a significantly more pleasant screening environment at Dallas-Fort Worth (DFW) airport. Qylur Security Systems has released an engaging self-service security portal that features playful colors and shapes. This is scary. Among other threats, the writer points out that by sending itineraries in unencrypted emails, travel companies are exposing their customers to an increased risk for burglary back home while they are traveling. He details step-by-step how easy it would be for criminals to harvest large lists of people who are away from home. Google has removed keywords from search referrers but the reasons may be less about privacy, as Google claims, and more about monetization. Coin has attracted a lot of attention, including from payments experts inside Expedia. This article goes a little deeper into the tech behind the Coin card. Trade negotiators may end up curtailing internet users’ rights in ways that lawmakers tried and failed to with their unsuccessful attempts to pass the Stop Online Piracy Act (SOPA) and similar legislation. Many people people have heard of using Amazon’s Mechanical Turk service for hiring freelance workers, but savvy organizations know that oDesk is the place to go to engage highly-skilled workers with good reputations. It can take time, but sanity often eventually prevails and the law catches up with technology. And the passage of time sometimes brings sanity to the regulatory environment too. Watching the video, I can’t help but feel that I am seeing an analog to the early Pong game that might evolve into something far more spectacular in a couple of decades. ← Review: Is Mygola The First Big-data Trip Planning Site?